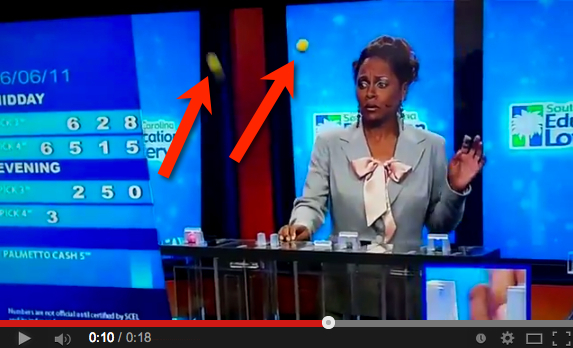 Here's the moment when the South Carolina Education Lottery 2011 tv draw malfunctioned, shooting balls all over the studio and startling the announcer. Over the last 30 years of lottery draws, security procedures have improved - apart from a rare occurrence like the South Carolina draw above. The New York Lottery maintains several duplicate sets of Lotto balls. A set is chosen at random before each drawing. - The balls are weighed before and after each drawing to make sure no tampering has taken place. - The equipment is all kept in a locked vault until just before the drawing. A New York Lottery draw taking place. A Pennsylvania lottery tv draw in 2014. As a result of this scandal security has tightened up for lottery drawings, and officials around the world today claim there is no chance of doctoring or fixing any lottery results.